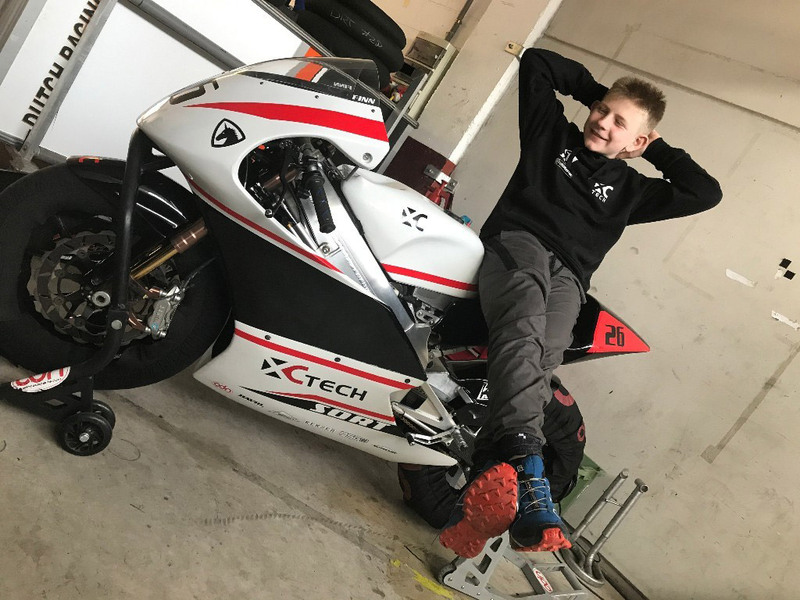 Jonathan Finn recently wrapped up two successful testing sessions on his Team XCtech BeOn Automotive built Canadian Tire – Cobourg Pre-Moto3 machine in advance of this weekend’s 2018 RFME CEV opening round. Pre-Season testing began March 3rd and 4th at Circuit de Calafat located 140km south of Barcelona. Circuit de Calafat is a 3.25km, 16 turn clockwise circuit. Although Circuit de Calafat is not on the 2018 RFME CEV calendar, the track offered a good opportunity for Finn to get acquainted with his new Pre-Moto3 machine. The team’s goal was to provide Finn with as much seat time as possible while obtaining baseline data that would help with bike setup throughout the racing season. Although the second day of testing at Circuit de Calafat was plagued with intermittent rain, Finn logged in 157laps – roughly 510.25km. Overall, the team was very happy with Jonathan’s transition to the larger displacement Pre-Moto3 machine. The most recent test session was this past weekend at the 3.55km 14 turn Circuit de Albacete which will host this weekend’s 2018 RFME CEV opening round. Unseasonably cold temperatures, high winds and damp conditions hampered the progress Finn had made so far. The RFME CEV changed from Dunlops to Bridgstone tires for the 2018 Pre-Moto3 season, adding to the challenges presented by the less than ideal conditions. Not deterred by these various obstacles Finn completed 76 laps (296.8km) adding to the valuable seat time. Although the number of laps completed were half of that completed at Calafat, his previous knowledge of the track allowed him to push the bike, making progress each session. His efforts were rewarded by finishing the final session with a Personal Best time. “I’m excited to be back in Spain with Xavi and the XCtech team and riding again after the offseason. I’m enjoying my new Pre-Moto3 machine, especially the 20 more horsepower over the 85GP machine I was on last year. It’s also slightly bigger, which fits me really well.” said Finn. “I’m very happy with the testing we’ve done so far. I’m feeling at home on the bike and we’ve collected a lot of data to give us a good baseline setup for the start of the season.” added the 14-year-old Canadian pilot. The 2018 RFME CEV Pre-Moto3 Championship gets underway with a doubleheader this weekend Circuit de Albacete, April 6-8th. The series also visits famed circuits across Spain such as; Motorland-Aragon, Barcelona-Catalunya, Jerez and Circuit Ricardo Tormo, Valencia. Jonathan is thankful for the support from Canadian Tire – Cobourg, Arai Helmet Americas, Bickle Racing, Human 2.0, Impact Safe-T Armor, Marsquest, BigB Racing and VNM Sport.